Global CH4:: Decadal Methane Increase Above 70 ppb. 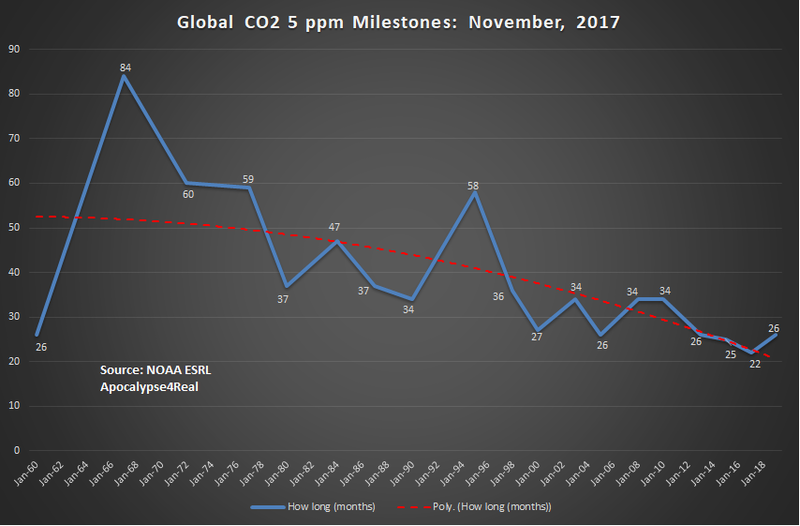 NOAA ESRL published the November, 2017 global methane (CH4) concentraion data on February 5, 2018. Once again we established a record high as atmospheric methane hit its annual peak. Last November's concentration was 8.9 ppb above November, 2016, continuing the higher trend after a brief slowdown in early 2017. 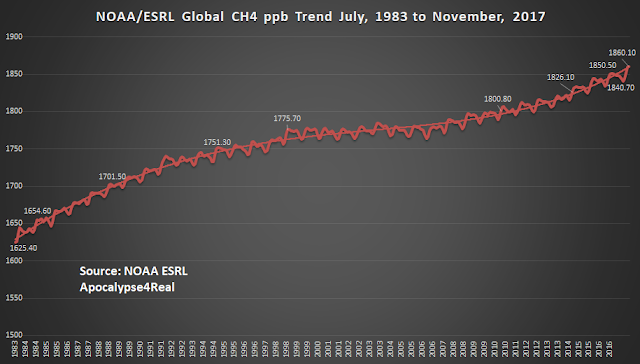 It is sobering to realize that global CH4 has increase over 13% since November, 1983. There is no slow down in its annual increases since 2007. 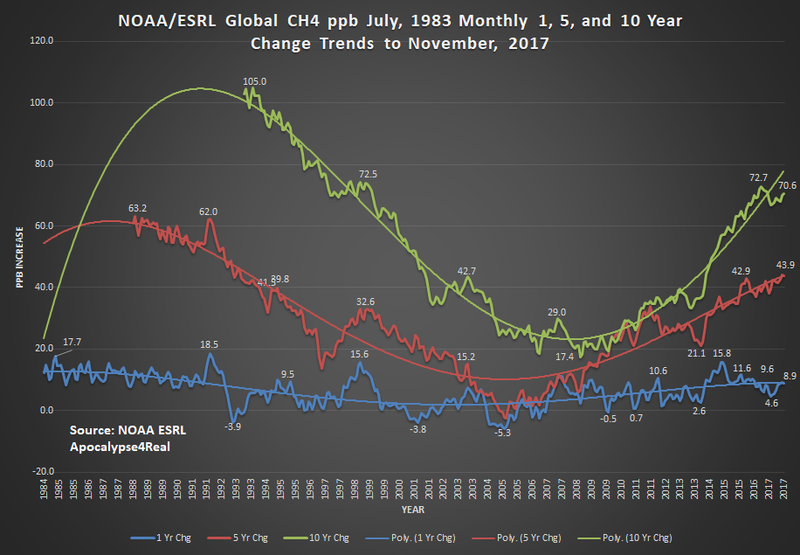 Additionally, the rate of concentration increase has not continued to drop after the last El Nino, but is sustained above 7 ppb annually for the last 10 years. 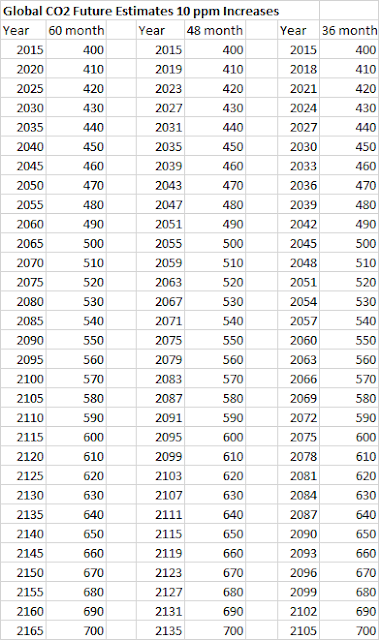 While the November, 2017 reading was 8.9 ppb above 2016, it is 43.9 ppb more than November, 2012, and over 70 ppb higher than November, 2007. 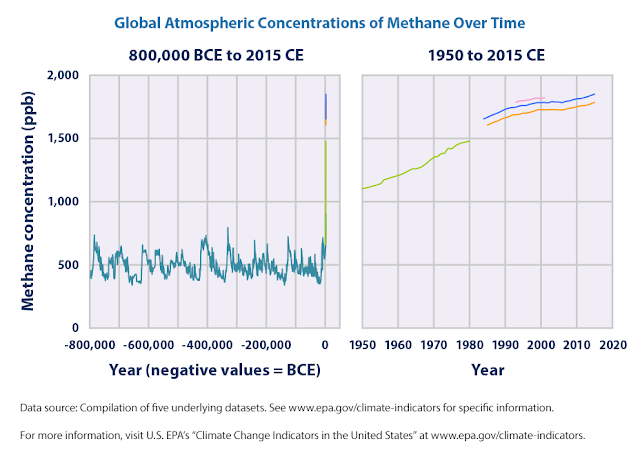 Even more sobering is being reminded once again that we live in a 250% higher global methane concentration since pre-industrial(assuming 725 ppb in 1750-1800). 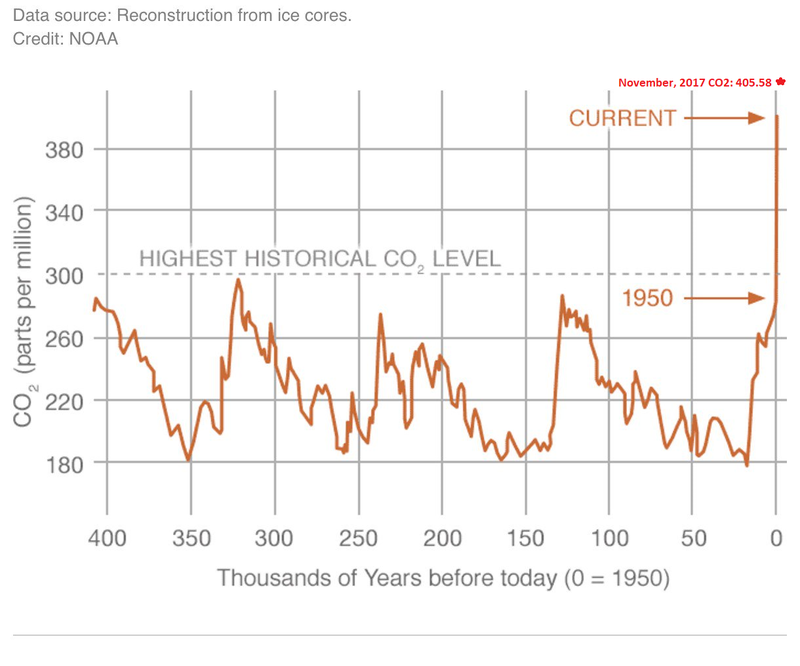 We also live on a planet, that based upon ice core data, has a higher atmospheric methane (CH4) concentration than at any time in the last 800,000 years. On February 5th, the latest NOAA ESRL Global CO2 update was released. The preliminary November 2017 concentration was reported at 405.58 ppm. 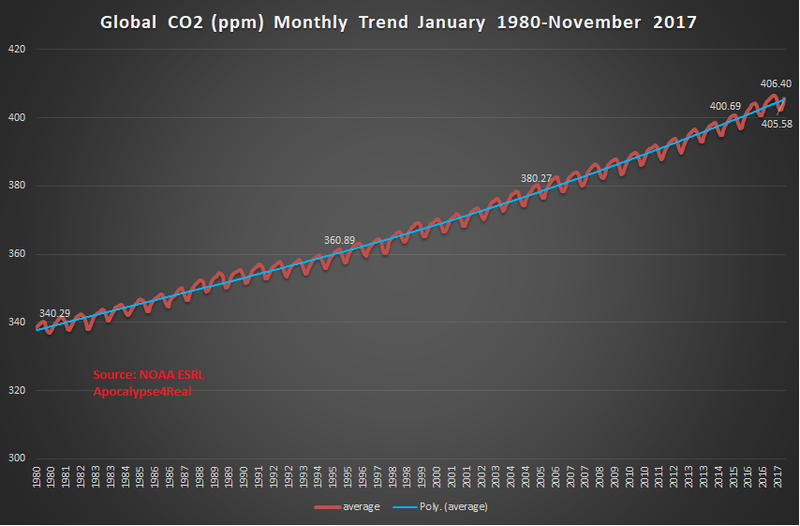 This is 2.06 ppm above November 2016 and a new high for the month. 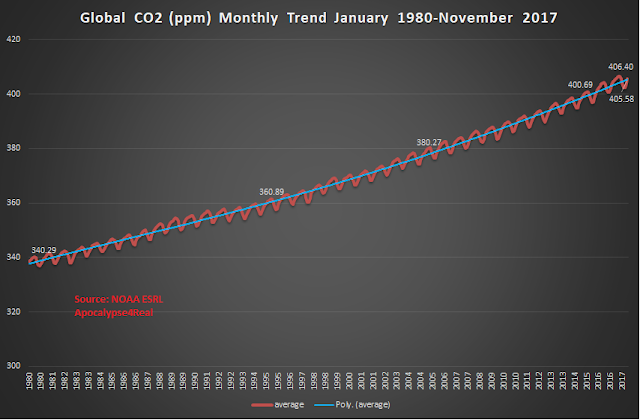 Since November 1980, the world has experienced a 19.7% increase in atmospheric CO2 concentration. 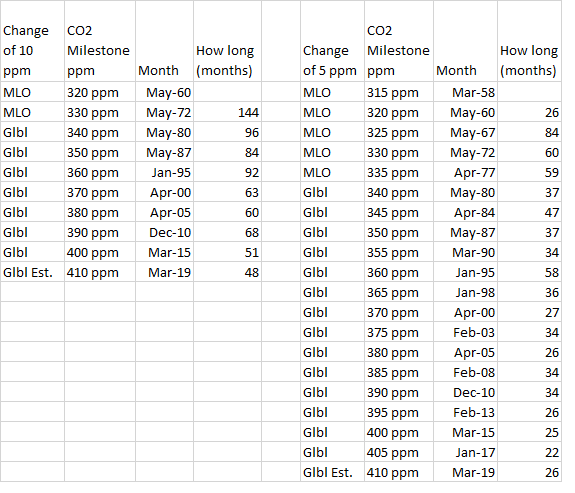 If we assume a pre-industrial CO2 concentration of 278 ppm, then we have undergone a 46% increase. 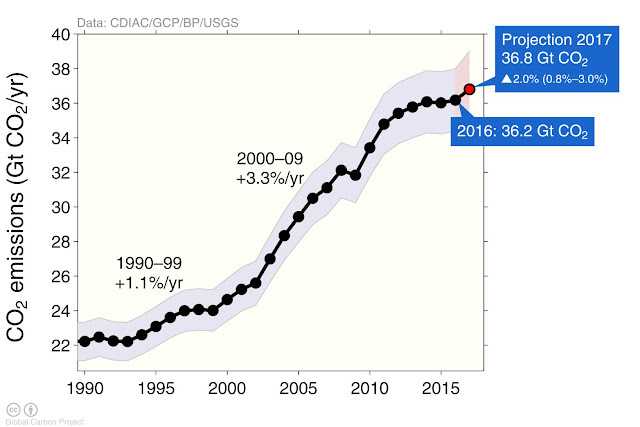 The annual, five-year and decadal CO2 concentrations remain at historically high rates of increase. 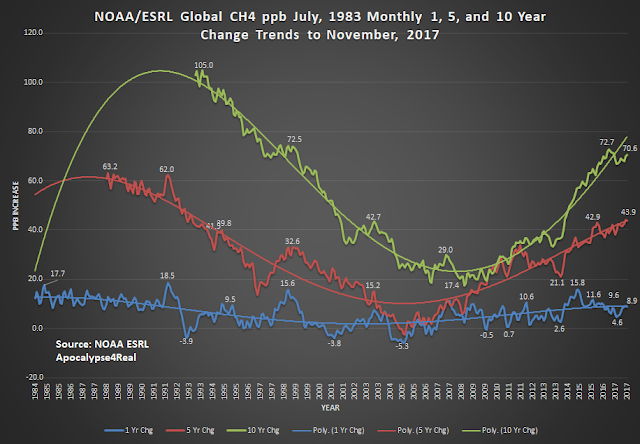 The annual change had dipped under 2 ppm during the past three months. 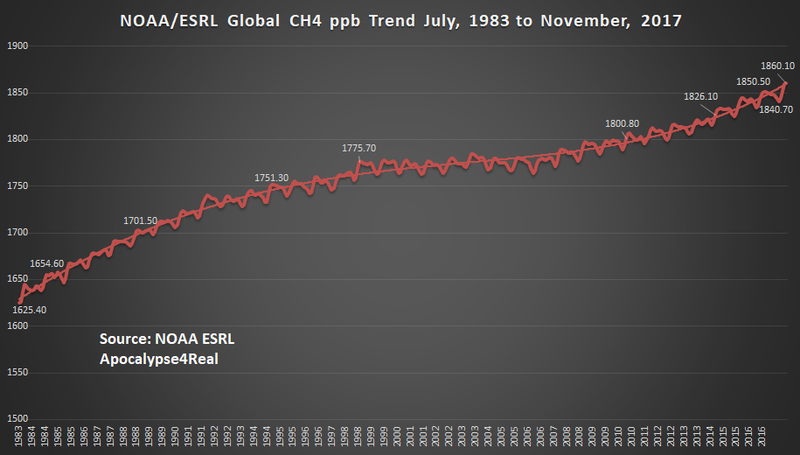 The last time that had occurred (less than a 2 ppm increase) was December, 2014. The five year increase rate is back over 12 ppm, a rate first reached in November, 2013. 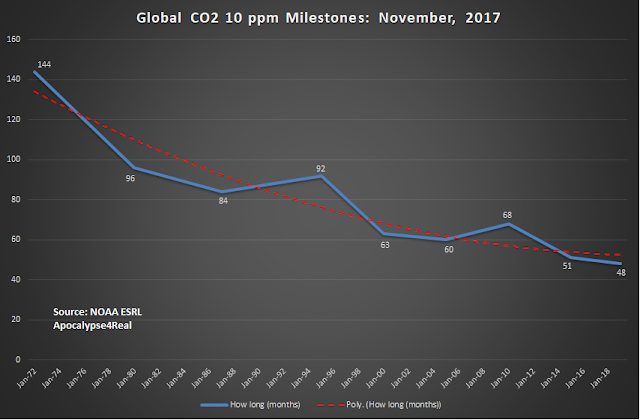 Since November 2007, global CO2 has climbed over 22 ppm, a rate first achieved in August, 2016, and has mostly remained above the 22 ppm increase rate since that month. 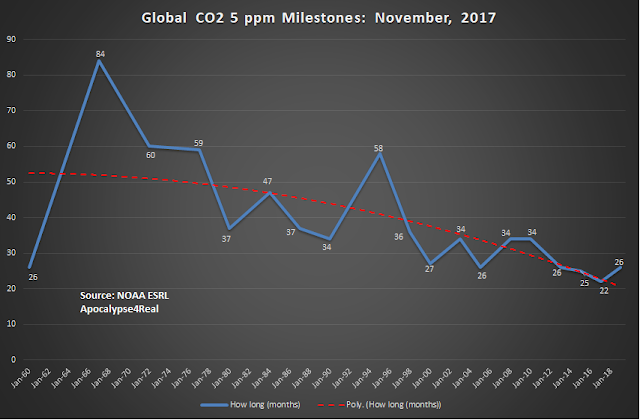 If emissions continue at this rate we will experience our first month above 410 ppm in 2019. 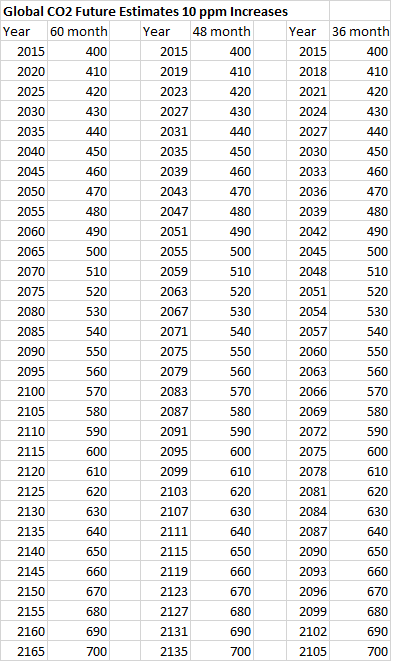 Here are the historical rates of increase for each 5 and 10 ppm based upon MLO and Global data as it became available, and the table, including an estimate for 2019. We have blown past any CO2 concentration recorded in the past 400,000 years. 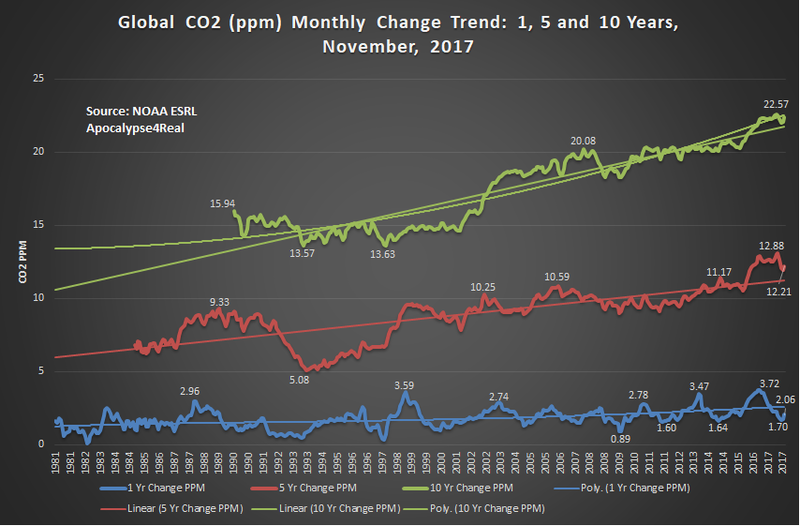 if we continue this rate of increase, we will add about 10 ppm every five years, and even at faster rates will soon move the planet into dangerous climate disruption territory. While speculative, these business as usual or continued accelerating increases will severely damage global social stability by its impact. One can hope that the international community will soon take steps to slow and reverse the 2% GHG increase which occurred in 2017. 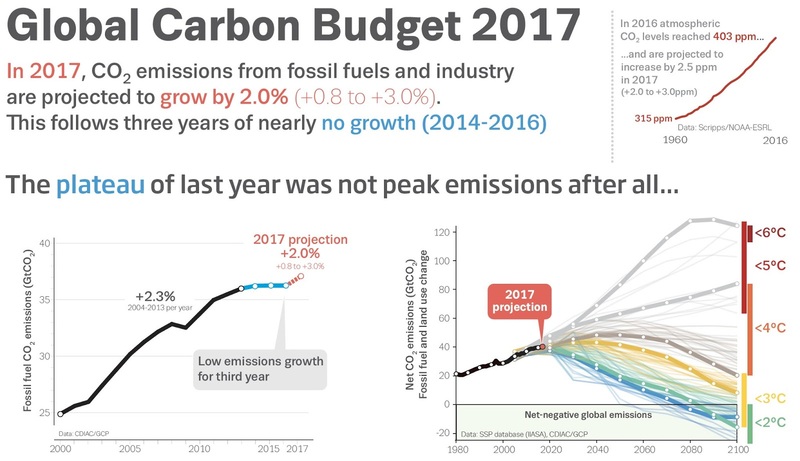 The struggle to balance economic growth while lowering emissions is difficult but necessary since climate sensitivity is creating social destabilization faster than anticipated. More on this another time.